Surf Fishing | Capt Tony's "Walkingangler.com"
When fishing on the surf, the fish are usually very close to the wash. Throw you bait within 10-15 feet out. For best results – read the surf first. Look for differences in the water and waves. focus on areas of turbulence or outflows or rip currents. Also look for sloughs. A slough is a narrow channel of water moving parallel to the shore. These shore side rivers of water feed the outgoing rip currents and hold many types of bottom fish. When casting into the waves, I alternate locations. I look at the area as a clock. I separate the waves in front of me as hands on the clock: ten – twelve and two. I then identify distances as far, near and close. So when casting into the waves, I first cast twelve far, then ten far and then two far. I next cast twelve near, ten near and two near. And finally, twelve close, ten close and two close. Using this casting technique allows you to cover the entire area quickly. If you feel a bite or a slight tug, than focus more in the range. 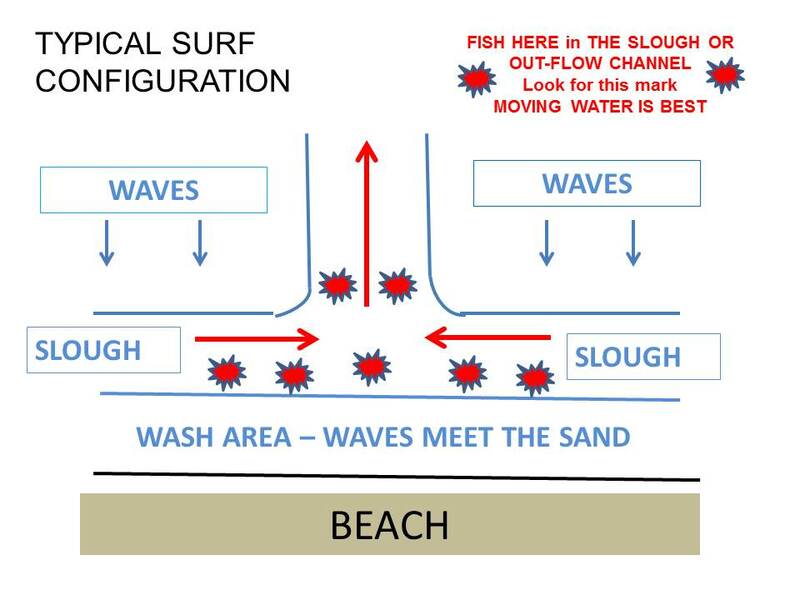 But don’t forget to cast right and left of that area – fish move with the currents so follow them.